The best family hotels in COPENHAGEN are reflections of the city itself: laid-back, welcoming, with great food and an element of dapper Danish design. These hallmarks run through all of our favourite places to stay, and even the more expensive hotels are free from the exclusive atmosphere that can pervade some high-end city establishments. You don’t have to worry so much about location, as staying anywhere in Copenhagen’s compact centre will put you within easy walking (or cycling) distance of most of the city’s sights. Enjoying your Mini Break Copenhagen at any of the following family-friendly places will help your kids remember their visit long after your trip has ended. 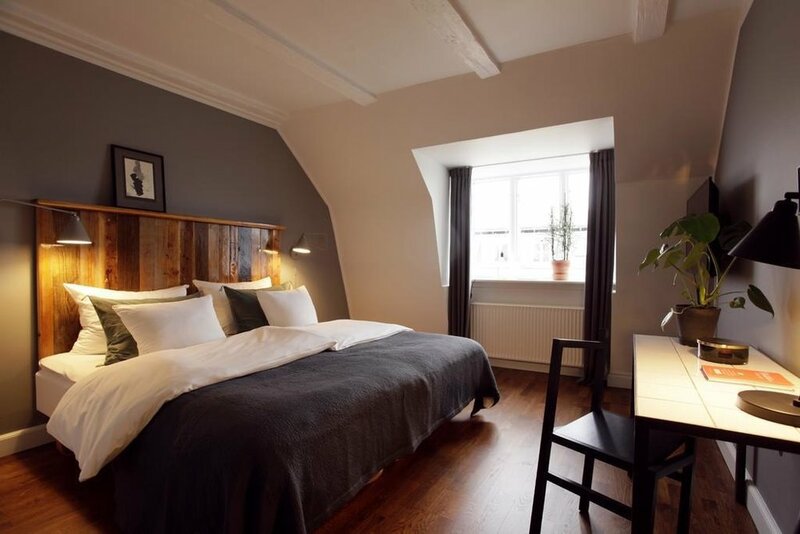 You can reserve our recommended places to stay in Copenhagen through Booking.com; clicking on the hotels’ name below will take you directly to their booking page, where you can fill in your dates and secure your stay. To find out more about why we’ve partnered with Booking.com, see here. 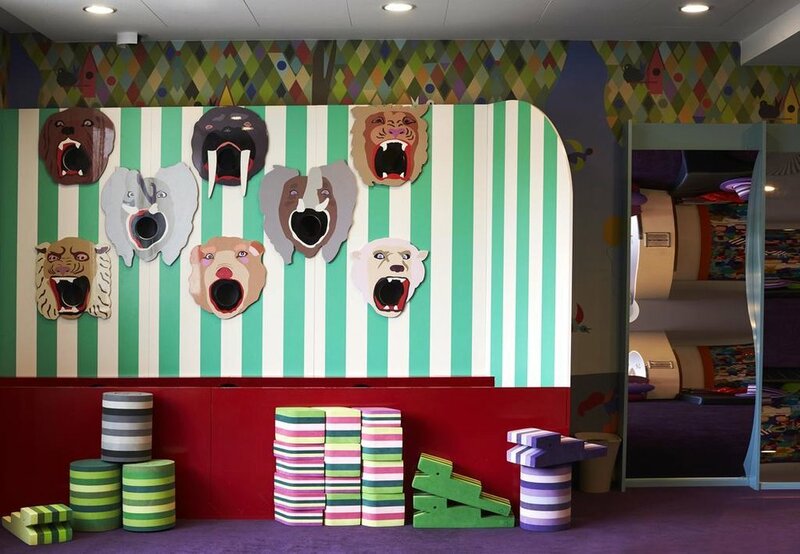 Colourful and fun are the watchwords at the TIVOLI HOTEL, which has taken the fairground theme of Copenhagen’s beloved amusement park (just under a ten-minute walk away) and sprinkled it over some more contemporary Danish design. A complex of several Jenga-like buildings, it’s a big hotel, but that means that amongst the 675-plus rooms are several different kinds of family room, sleeping either 3 (with a sofa bed for one child) or 4 (with a sofa bed for two). If you’ve got two little travellers in tow, ask for a High Floor Family Room – the double bed is smaller, but the rooms are located in the quieter Harbour Tower (the City Tower can get some noise from the train tracks below) and come with better views, either over the hotel’s garden or of the Inner Harbour. 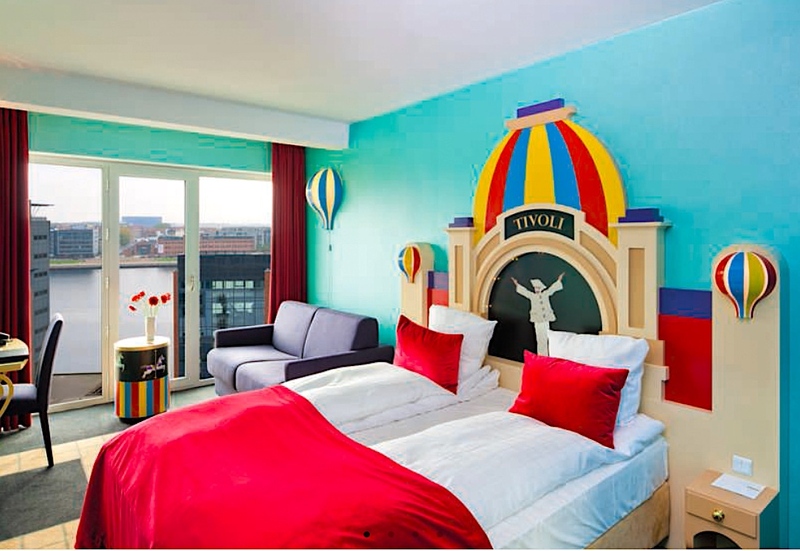 There are also themed rooms, inspired by the park itself, with drums turned into tables in the Guard Room or lamps shaped like Ferris wheels in the Tivoli Room. The family rooms can be a bit on the small side, so if you want more space, you can opt for two (or more!) interconnecting standard rooms. The Harbour Tower’s “starry” ceilinged indoor pool is a big plus, but there’s also a colourful playroom, with a climbing wall and ball throw, and an outdoor playground. During school holidays, you can also play table football, air hockey and PlayStation games in the Gaming Lounge or enjoy a nightly movie at the Children's Cinema. Another nice seasonal touch is the Children’s Reception – whilst you’re checking in, your kids can get busy finding out about the latest children’s activities (and claiming their welcome gift). Once you’re settled in, you can also rent Christiana bikes, reverse tricycles with room for a parent and child (or two, if they’re small) in the front cargo box, and set off for a ride on the nearby Harbour Circle cycle path or up to Jægersborggade. The Tivoli has three restaurants (the Brasserie has a kids’ menu, Sticks’n’Sushi, on the roof terrace, has great views across Copenhagen), and pizza and guo bao sandwiches can be ordered on room service. Breakfast (additional cost, unless you’ve booked a package) is always excellent, but it gets extra family-friendly during summer with the Tivoli Breakfast Club, a kids’ buffet with fun things like watermelon “lollies”, smoothies and donuts (hey, they’re on holiday!). The tone of this informal boutique hotel is set as soon as you step through the door. The staff at KONG ARTHUR have an endearing knack of making guests feel immediately at home in this quiet corner of Copenhagen, no doubt assisted by the cosy communal area, with its comfy armchairs and flickering fire. The rooms are equally welcoming, though each one is different; some have views over the inner lakes and the parks beyond, others look out onto the flower-filled central courtyard. All the Superior Doubles are spacious enough to fit two extra beds, which is unusual for a city-centre hotel, whilst the suites either have two queens or are split-storey, with a double on the mezzanine and a sofa bed (big enough to sleep 2) down below. Best of all are the hotel’s designer-cool ARTHUR APARTS, three-bedroom penthouse apartments that are connected to the Kong Arthur by private lift. Styling is an appealing mix of funky Scandinavian furnishings and homey details (rich dark-wood flooring, plenty of pot plants, comfy beds sagging under the weight of plump pillows). There’s a lovely kitchen-diner – fully equipped, thoughtfully stocked and with a tempting hammock swinging from the ceiling – and a large living room with L-shaped sofa. The rooms (each with their own TV) sleep 6 in two kings and a decent-sized double. You also get a hot tub in the bathroom. The apartments share all the hotel’s amenities, including daily Cosy Hour (free wine and elderflower squash) and the fantastic Nordic buffet breakfast, a local, mostly organic spread of baked breads, cold meats, cheese and other delights such as homemade sea buckthorn jam and beer-batter waffles (included in most rates; otherwise, 185kr, under-18s 90kr, under 6-s free, 1 child eats free). Kong Arthur and the Arthur Aparts are easy to get to (Nørreport Station, served by trains from Copenhagen Airport, is less than ten minutes away), and although it’s on the edge of Indre By, Copenhagen’s compact size means that everything is still very much within walking distance, with Torvehallerne reachable in just five minutes and Tivoli Gardens and the main shopping street of Strøget within fifteen.